Jonas Brothers' fan purchased over 800,000 tickets for the upcoming World Tour resulting in sold-out arena shows in major cities including New York, Los Angeles, Chicago, Philadelphia, Washington DC, Houston, Pittsburgh, Edmonton, New Orleans and Atlanta. Second dates were immediately added in Los Angeles, Chicago, Philadelphia and Vancouver. 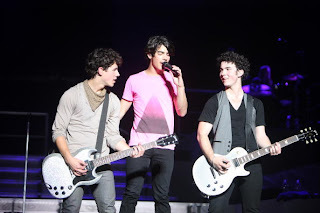 In addition, the Jonas Brothers sold out five arena shows in the New York area. The tour will include a massive 140-foot plus stage centered in the arena. The show will feature cutting edge technology used in a one-of-a-kind circular water screen, multi-color laser effects, motion automated video screens, a giant crane levitating over the audience plus other surprises that will bring the tour to the next level of concert entertainment. Starting on May 17 in Monterrey, Mexico, Jonas Brothers will bring their world tour to Latin America for six dates in countries such as Peru, Chile, Brazil and Argentina. Demi Lovato, will be opening all Latin American shows.